Blog | Dusthouse | A creative collective of Film-makers, Animators, Illustrators, Graphic Designers, Sound Designers, and Composers. Dusthouse are delighted to announce that our film, A Summer Hamlet, has just won the Audience Choice Award at the Fort Myers Film Festival, Florida. As the film continues it’s journey on the festival circuit we catch up with director Helen Lawson for a quick chat. A Summer Hamlet has just been awarded the Audience Choice Award for 2014. Why is this award so important to win? It’s wonderful for ‘A Summer Hamlet’ to win the Audience Award at the Fort Myers Film Festival because it shows us that this film has support from people around the world, and that it appeals to people beyond the world of theatre and cinema. It was an honour to be selected for the festival in the first place, and incredibly touching that so many people voted. Tell us about the Fort Myers Film Festival. The Fort Myers Festival was a joy to attend. The programme is incredibly varied, with narrative films, animation, and documentaries from all genres all included. There were films that made me laugh, cry, think… More than anything, the organisers of the festival were hugely welcoming and fun to be around, and the other filmmakers attending all seemed to be having an equally good time! Does the story of a very English company touring a very English play transfer over the pond? The wonderful thing about Hamlet is that the story is so universal, and the fact we see the actors perform the story in Denmark, Austria, Norway and Malta is proof that the story can transcend the language. It is a very English group of actors though, so perhaps certain references in the film like ‘Blackadder’ and ‘tiddlywinks’ don’t translate everywhere! 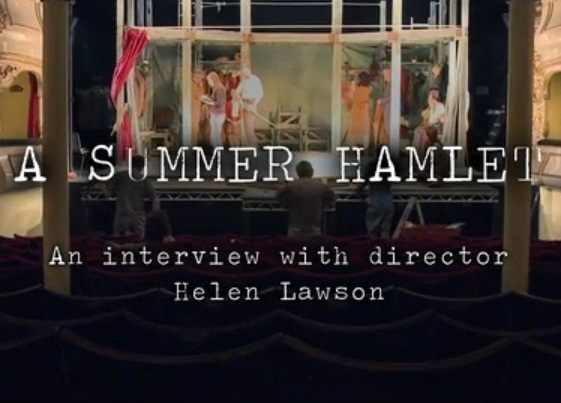 Above all, though, ‘A Summer Hamlet’ is a film about friendship, and an insight into what goes on behind the scenes. Curiosity about those things exists everywhere, so despite the odd cultural difference I think it’s a story that intrigues people everywhere. What is unique about A Summer Hamlet? A Summer Hamlet is unusual because it gives us a glimpse behind the curtain. Anyone who’s ever seen a play will have wondered what is going on backstage, and this is a chance to see! We don’t really show the play in the film, because what’s more important in this film is to watch the actors as their friendships develop backstage, to see the jokes, the mishaps, the exhaustion, and the effort to repeat the same play with the same passion night after night. The moment when an actor becomes a character is something we never usually get to see, and we get to know these actors so well that we start to understand that moment. Where next for the film? We’re hoping there’ll be another festival or two before the festival run comes to an end, and then we will be looking to do an indie cinema release. After that, broadcast and then DVDs! I’m currently working on a lot of short-form projects, while ideas for my next feature documentary crystallise in my head! Why work with Dusthouse on this film? Dusthouse are so brilliant because they have pioneered the use of film to promote theatre. It’s a medium that speaks to the younger generation, and Dusthouse harness that without losing the essence of theatre. Their concept films are invariably gorgeous to look at and incredibly compelling, while their documentary work is also insightful and inspiring! First time viewers and old time Dustheads, welcome to the all new Dusthouse.org. You are very welcome. Take a look around… enjoy our latest releases and remind yourselves of some classic films from our vault. You’ll be able to keep up to date on our very own blog which we will be updating regularly with exclusive behind the scenes snaps and footage. From time to time we’ll chat about work and other times we’ll leave you with sneaky recommendation for film, theatre and music. They will always be lovingly crafted by Dusty and Co. Crumbs, we may even have the odd competition.